Looking for a two tone safety vest for your work site? Look no further! 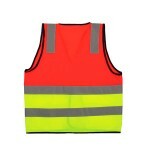 Whether you’re a roadwork supervisor, a crossing guard, or a construction worker, you’ll find what you need in our range of two tone safety vests. Bright 50mm reflective tape comes standard, with your choice of Hoop, H, or X Pattern design. Our entire range of two tone safety vests are designed to meet or exceed AS/NZ Standards, with tough, high quality materials, and manufactured to order right here in Australia. If you want something specific to your needs, that’s easy! With our convenient customisation service, you can add your own design or logo right when you order – no fuss! And with our super fast shipping, you’ll have your custom vest delivered right to your door before you know it! 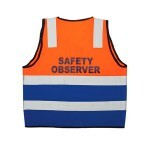 Reflective Bi Coloured Safety Vest Take the guess work out of finding the right safety gear with our reflective bi-coloured safety vest. Each safety vest is manufactured with tough, lightweight mat..